Two unexpected coincidences. I read a beautiful memoir by Stefan Hertmans, War and Turpentine and then visited Tate Britain to see the new exhibition of paintings by Paul Nash. The book is a memory of his grandfather, a man that always seemed to be painting copies of the great masters. Shortly before his death Urbain gives his grandson a set of notebooks, though it is many years before he actually reads them. They are the notebooks that describe in accurate and appalling detail his war service in Belgium during World War 1. Slowly a picture emerges of a young man, fighting a hopeless, chaotic and bloody war against a stronger and more ruthless enemy. Such actions that Urbain witnessed were unparalleled in savagery, such that he could not mention them again. So he painted, again and again simple, peaceful landscapes, mostly devoid of people, or many and detailed copies of famous grand masters, Rembrandt, Velásquez and others. Hertmans, once he gets around to looking at the notebooks, begins to uncover a life filled with loss, horror and sadness, but it is through discovering this that he finally begins to understand his grandfather. He comes upon him one day, weeping over a copy of Diego Velásquez‘ The Toilet of Venus [more commonly called The Rokeby Venus now in the National Gallery]. What was it about this particular painting that could evoke a memory so painful that a grown man should weep? Towards the end of his journey through his grandfather’s life, looking again, finally – properly – at his paintings, he sees something that reveals the man. This book is a tour de force, the slow and steady accumulation of knowledge, as the author physically traces the steps of his grandfather, taking stock of places named in the notebooks, going to the places and looking, trying to imagine what his grandfather saw, probably through the target lens of a rifle or his binoculars, brings him to a place where he begins to understand the warrior, but it is something quite other that draws him towards the appreciation of the man. This discovery also reveals the nature of his grandparents marriage, how it came about and its consequences, both for his grandparents and for his family. A telling, subtle and rewarding book. A look into the past, seen through the lens of the gun and of the painter, a painter who never in all his life painted a single picture of the war. The exhibition at Tate Britain similarly tells the story of a painter, starting from his 20’s and passing through all the stages of his painting and development through to the final year of his life. Paul Nash developed different styles of painting, from exquisitely detailed pieces in monochrome, showing a sensitive artistry and graphic skill, wood engravings, calligraphy and book illustration, (poetry even) right through British Surrealism and Expressionism to abstraction and finally back to landscape. In all this, Nash changed styles, media and colour. His early works, often including trees and birds showed a definite mind-set, were frequently monochromatic and often studies of the same view, accurately, stylised or abstracted. At the bottom of some fields near his family home, for example, there were three elm trees. These appear often, sometimes in daylight, more often in moonlight, occasionally in silhouette, vastly out of scale with the landscape in which they are placed. All the more poignant because they have virtually disappeared from the English landscape. This period was interrupted by the First World War. Paul Nash joined the Artists’ Rifles. He was in active service on the front line trenches in France. Sadly, at a time when he was convalescing after an accident in which he broke a rib his battalion, stationed on Hill 60, received a devastating and fatal attack and nearly everyone was killed. Nash’s paintings of that time, some of them the best known of all his work, were made later on and were a memorial to his lost comrades. Paintings of the view from the trench, blasted trees standing in a sea of mud, and views of the trench showing soldiers on duty, many of these pictures show no man’s land at night, lit by flares and starlight in eerie and horrible ghastliness. A single monochrome work, shows unusually, the aftermath of the bombardment with dead bodies, barbed wire and chaos. From there he moved towards painting interiors, generally of places looking out from indoors. His style has altered once again, taking on a symbolic message, death lies in the garden; a huge tree stump with a naked billhook thrust into its heart was painted after the death of his father, and is simply called February. Trees in an orchard look as much like barbed wire defences as apple trees, stacks of chopped logs and a snake coiled around a fence represent both death and healing. There are often other mirrorings, from his flat window in St Pancras, he mixes the supports in a pot plant (the plant itself is dead) with the back of an advertisement hoarding and the window frame, making the viewer step back to figure out what exactly is going on here. His dabbles in abstraction, filling his canvases with objects, often mathematical or draughtsmen’s tools, strange perspectives. His landscapes of Berkshire and Oxfordshire however, return more and more to the naturalistic, though there is often something uncannily like the world war landscapes in the placing of ponds and curving hills. But trees and birds abound. His flirtation with Surrealism and Expressionism failed to move me, it seemed to be an experiment engaging the mind and not the heart, though they are some of his more favoured works. The Second World War intervened and he joined the war effort as an official war artist, his age though, kept him in England. Here he was taken to places where Nazi planes had crashed, and he faithfully recorded these spectacular failures: a huge plane, nose-cone deep in Windsor Great Park, a downed bomber bellied in a corn field, and the most famous painting of all – a graveyard of smashed bombers, looking for all the world like a furious ocean of waves, until you pick out the swastikas and black crosses on wings and tailfins. There is an accompanying video film of Paul Nash visiting this extraordinary place, where smashed planes were gathered in huge stacks. Paintings of the Rye Marshes and Dymock were done when he was recovering from a nervous breakdown, the angular sea wall and the river bending towards the sea take on sinister and war-like appearance, mirroring once again his trench experiences in an earlier war. After the war, Nash returned to Boar’s Hill, his house looked across to Brightwell Barrow. A view that he had first painted in 1912, calling it Wittenham Clumps, though this is a mis-nomer. The final room in this exhibition shows about sixteen different paintings all of the same view, though you need to pay attention to see this, since he moves or eliminates various strategic trees, plants or visual clues. Two of the most striking show the sight of the clump, a high hill with beech trees at its summit, in an eclipse. You see both the sun and the reddened moon floating above this familiar but not familiar landscape. Both painted in 1946, the year of his death. The trees have grown since then and it is no longer possible to see exactly the view that Paul Nash painted, but you can visit the footpath near Castle Hill, Brightwell Barrow itself, though, is on private land. 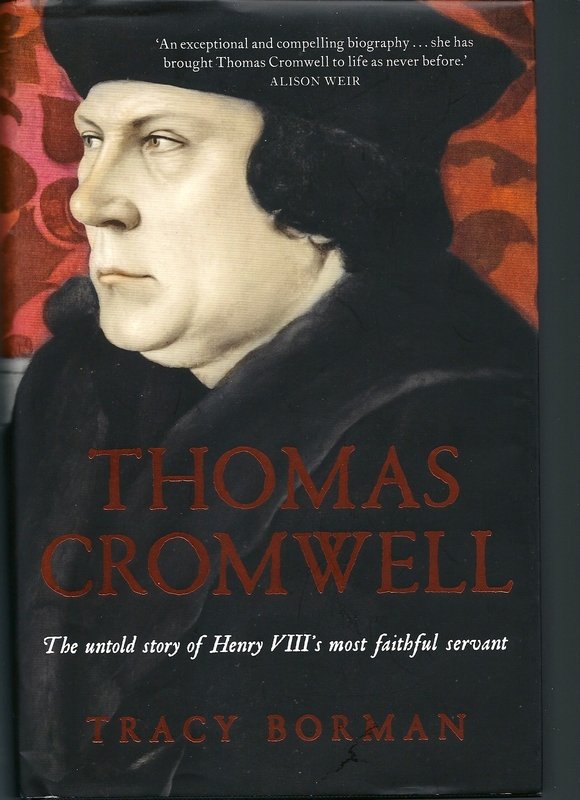 Inspired by Hilary Mantel and intrigued by Hans Holbein and aided and abetted by her new publishers Hodder and Stoughton, Tracy Borman has written a biography of Thomas Cromwell. This lively account threads its path through the thickets of myth, murder and mayhem that surrounded the court of Henry VIII to find a more humane, if not more driven character in an examined life of Thomas Cromwell. From his portrait in The Frick Collection(New York) painted by Hans Holbein shortly after having been made Keeper of the Jewels, so in about the middle of his career, Tracy Borman finds a face of a serious, steady, well-fleshed man with no apparent cruelty about the mouth or eyes. I would agree with this. The two Hans Holbein in The Frick face each other across the divide of the fireplace, Thomas More and Thomas Cromwell – colleagues and then enemies in the King’s “Great Matter”. I pay these two a visit every time I go to New York (along with all the other treasures: three beautiful Corot and countless Whistler portraits and much else besides), Cromwell was not there last time I went but I understand that the other inspiration for the new book, Hilary Mantel’s Wolf Hall and Bring up the Bodies have led to an increase in the visitors to that room. Of course, a biography takes us beyond the point we have reached in Bring up the Bodies, so forgive me if you think there is a spoiler alert due here. After having Anne Boleyn summarily executed, Henry VIII went on to wife number three, the lovely Jane Seymour, who’s family actually lived at Wolf Hall and then four, Anne of Cleves, who by the magic of Hans Holbein’s paintwork appeared delightful and turned out to be less that wholesome, earning the unkind nickname The Flanders Mare. At it was at this point that Thomas Cromwell’s star began to wane, though Henry VIII was nothing if not fickle, so this was not a gradual decline, Thomas still had his uses. There were still moments of great honour but Thomas should have been aware that these honours did occasionally presage dishonour, as the royal temper flared and his enemies pounced. What Tracy Borman uncovers, though, is a man of prodigious energy, mindfulness and foresight. Thomas Cromwell changed the landscape and the religion of England, by persuading Henry to throw off the shackles of Papal Fealty he open the gate to the English Reformation, and while his Lutheran zeal may have been too strong for his royal master it led the way. It was Thomas Cromwell who saw to it that every church in England should have a copy of The Bible in English (Coverdale’s translation) as well as Latin . Though as every English school-child knows, Thomas Cromwell was also responsible for the Dissolution of the Monasteries. When it began it was probably a wise and necessary move, there was a decreasing number of people entering monastic life and there were many smaller houses that were run uneconomically, not to say wickedly – so appropriating their lands and income had the advantageous effect of increasing the royal coffers while not greatly inconveniencing the inhabitants who could go to the larger houses. It did however greatly affect the poor, sick and needy – many of whom faced a life of greater deprivation on account of this loss. Further depredations on these monasteries and convents, especially the larger ones was a more fundamental and deleterious loss to the whole country. You only have to read HMF Prescott A Man on a Donkey to learn how bad it was. Still it is also evident from the many letters expressing gratitude that still survive, that Thomas Cromwell personally assisted many people who applied to him for help, and quite clearly the poor people of London held him in great respect. It was also Thomas Cromwell who engineered a more systematic approach to the ordering of Parliament and the increasing of its powers, so it is worth remembering this when considering his great-grandson, Oliver. It was towards the end of his life that things begin to drift towards the Thomas Cromwell of history, a man so hated and with a reputation so blackened that it took Hilary Mantel’s novels to drag his reputation out of the mire. There is no doubt that Thomas used his influence at court to have certain people disposed of, some of them genuine enemies of the Crown, no doubt, but equally some of them simply standing in his way. Which is not to his credit, obviously, but it is no less what others did to him once his power had waned sufficiently for them to reach the King’s ear. Calumnies were the order of the day. Injudicious remarks in private could cost you your neck, if it meant a gain to someone else more powerful. Thomas Cromwell used it against Anne Boleyn and the Dukes of Norfolk and Suffolk used it against him and Henry VIII was willing to act…and many people died as a result. Both Hilary Mantel and Tracy Borman show a man of humble origins, who against all the odds rose to the highest and most influential position in the country, the King’s right hand. Both authors show that it was his humble origins that most riled the nobles, that he should have positions of influence that they regarded as theirs by right of birth. After his death, Thomas Cromwell was not replaced, his positions were filled by many different people and Henry himself lived to regret his death. Contemporary writers and historians alike were quick to remember the bad things he did, and it was not until Geoffrey Elton, the Cambridge historian in the twentieth century began his research into Thomas Cromwell that the tide began to turn towards a more measured view of this extraordinary man. Rather presumptuously I have added a poem I wrote on visiting the Tate Britain exhibition of Hans Holbein’s paintings a few years ago. The sheer joy of it! The splendour and the thrill! Yet, as rich in character as are renaissance jewels. Owned now, by Queens, merchants and the rest. How to absorb it all, and hold in the memory? To see history now, that was his own today. The camera is not made that, for example, Erasmus could portray. We softly stroke the paint-worked pelt. How did he do that? Out-damasked damask, outshone silk? Create a person, or with a single squirrel’s hair create a brow? How did he do that, in lines a Hockney might employ, deliver a family? Seen, all in an afternoon.